FAA’s ATADS data shows Peak Year was 2004. Total airport operations in 2014 were DOWN 74% from the peak year. 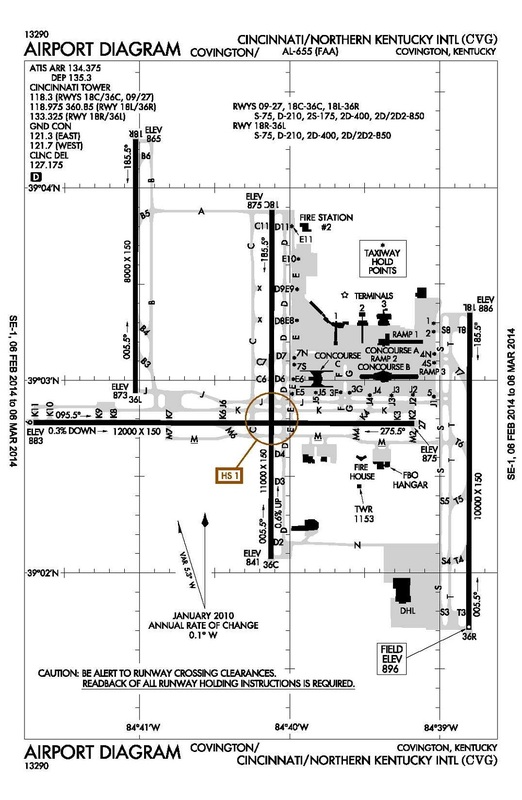 Also known as the Greater Cincinnati Airport, KCVG is an example of the boom/bust cycles airport communities endure, related to the whims of FAA funding and airline decision-making. The airport was proposed in the early 1940’s, to compete with (and maybe replace) Lunken Airport in Cincinnati, which had proven to be flood-prone. The airport opened in 1944 and was initially used for military flight training. Airline flights began in 1947, and jet service arrived in 1960. Comair began operating in 1977, and then Delta Airlines made the airport a hub in 1981. A major international cargo carrier, DHL, made a hub at KCVG in 1983. The Delta/Comair operation grew to become one of the biggest airline hubs in the U.S, and eventually thousands of passengers would scurry from gate to gate, making their connections. All these passengers passing through generated FAA AIP funds, to invest in more airport development. Terminals were added. A second north-south runway opened in 1991. Airport operations peaked at 516K in 2004 (this equates to 1,410 ops/day, or 29 takeoffs/ATC-hr; i.e., one takeoff every two minutes). The airport had more than a hundred gates when a third north-south runway was added in 2005. But then, the hub began to crumble. DHL relocated their cargo hub to Ohio. When Delta Airlines merged with Northwest Airlines, they all but abandoned the KCVG hub. Then, early on a Sunday morning in August 2006, 49 people died when a Comair flight crashed while taking off at Lexington. That accident drew public focus onto the fatigue issues (for both pilots and controllers) and the severe cost-cutting practices among regional commuter/feeder airlines. Eventually, in July 2012, Delta announced that Comair would cease operations in the fall. Geographically, KCVG is located in what would logically serve as a very efficient hub, a ‘mixing-point’ for nearly direct flights from all points in the northeast U.S. to all airports across the southwest, from New Orleans to Los Angeles. With three parallel runways and all those gates, it is astonishing to see so little activity at this airport. It is even more astonishing to see FAA ignoring the billions we have invested in KCVG capital improvements while directing new airline tax money toward other locations, to produce the next boom/bust airline hub.